Snap, Inc. announced earlier in 2016 that it had created a pair of video-recording sunglasses called Snapchat Spectacles. A limited number of Spectacles went on sale through a yellow pop-up vending machine in Venice, California and people finally got to see what was they were like. Spectacles are packaged in a clear tube roughly, which holds the recharging case, the glasses themselves, a USB cable, and a glasses cleaning cloth. The Spectacles come in three different colours: black, teal, and coral. Spectacles work with both Android and iOS devices. The user simply looks at the scannable Snapchat ghost icon in the app with the Spectacles, presses the single button on the top left, and the process handles itself from there. Patents published on November 1, 2016 give us an idea of Snap’s Spectacles inventions. 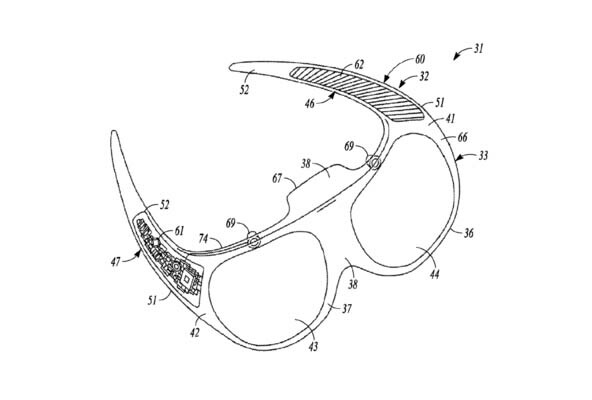 While the patent doesn’t address the Spectacles by name and are merely covering “smart glasses”, the drawings of the charging case are a close match to photos released by the company of the Spectacles. Snap Inc. declined to comment on this story. A wearable device comprising: a body having a frame configured to hold one or more optical elements, the body having a temple being disposable between a collapsed condition and a wearable condition in which the device is wearable by a user to hold the one or more optical elements within user view; electronics carried by the body including a battery carried by the temple and one or more additional electronics carried by the frame; and a connector disposed between the temple and the frame so as to be substantially obscured from the view when the temple is in the wearable condition, the connector is configured to enable establishment of an electrical and/or electronic connection between the battery and the additional electronics of the frame via the connector when the temple is in the wearable condition, and the connector is exposed and configured to couple with a second connector to establish a second electrical and/or electronic connection between an external source and the battery when the temple is in the collapsed condition.